For years now, I’ve wanted to try a robot sweeper — like an iRobot Roomba vacuum cleaner. Honestly, a few years after I started blogging (in 2004) Roomba asked if I’d be interested in reviewing their robot sweeper. But, at the time, I didn’t think an auto vacuum cleaner that looked like a Frisbee could possibly be effective at cleaning floors — especially with pet hair — so I passed on the opportunity. 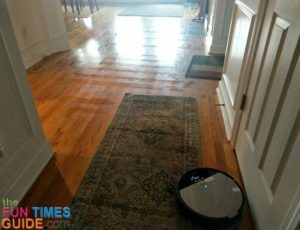 But recently, the folks at iLife asked if I’d like to review their robot vacuum cleaner… so I jumped at the chance. I’ve (obviously) changed my tune about the auto vacuum cleaner since then — because the robot vacuum cleaner reviews I’ve read seem to be quite positive, for the most part. 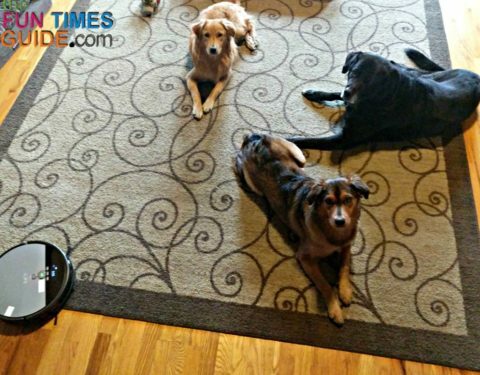 And these days, I’ll welcome any shortcuts for vacuuming my home with 3 dogs! iLife V8 – an advanced auto vacuum cleaner with wet mopping features and an updated pet hair system (charging stand and remote, too). iLife has released at least 5 different V-series models with various features and improvements. It’s lighter weight — better for lifting and emptying. The suction power is slightly more powerful. It has an interchangeable dust bin / water bin for dry sweeping vs. wet mopping — I talk in detail about the wet mopping feature below. The dustbin is larger and therefore holds more — so you’re emptying it less often. It is slightly larger in overall size (height and diameter). The V8 model is 12″ x 12″ x 3″. There is no brush bar/beater bar (like there is on the A8 model) — just a thin rubber strip next to the suction opening. As a result, the V8 doesn’t get “stuck” on things as often, it picks up pet hair more efficiently (a huge plus! ), and there’s no tangling of strings, threads, or rug fringe. The only downside I can foresee is larger items could inadvertently get sucked up into the dustbin. It is slightly louder, but still quiet enough to hold a conversation and listen to TV. The battery only lasts half as long — but it cleans more efficiently, so I don’t mind. And it sends itself back “Home” to recharge, so that helps too. It moves faster than the A8 model does. The A8 “speaks” what it is doing — “Auto cleaning will start soon” “Please put robot back to ground” “Please clean drop sensors”. The V8 doesn’t — it has a digital panel on top of the unit though, which shows what mode it is cleaning in. It’s pretty awesome to be able to keep doing whatever it is you’re doing and be cleaning your house at the same time! I’m the ultimate multi-tasker, and this robot sweeper adds one more thing (vacuuming!) to the list of things that I can multitask — because it’s so easy to just let it run while you’re doing other things. It’s much quieter than I thought it would be. And definitely quieter than a Dyson Compact Animal or Shark Navigator Lift-Away upright vacuum cleaner. (They’re the 2 other upright vacuums that I currently own — and love, by the way.) At 55db, this robot sweeper definitely wouldn’t wake a sleeping baby (or my 7-month-old puppies), or even my husband or me for that matter. But I’ve only chosen to run it while I’m awake so far. For comparison’s sake, most vacuum cleaners are rated at 70db and higher, whereas a typical speaking conversation is around 60db. There are 5 infrared (IR) receivers on the unit itself — so it easily recognize barriers and boundaries in your house. I can attest to the fact that the iLife vacuum has never banged too hard into a wall or dove off of a ledge or stairs in our home! And it traverses across rugs of various heights with ease (the V8 model even moreso). The spinning side brushes work amazingly well! They truly do “whisk” dirt and pet fur toward the suction area on the underside of the vacuum, where it ends up in the dustbin. The dustbin canister is super simple to empty — and slightly larger on the V8 model. TIP: If it has been awhile since you’ve vacuumed underneath your beds, dressers, and furniture, then you’re likely to notice a ton of super-fine black dust (like soot) that will fly everywhere when you empty the canister the first few dozen times. I definitely did… but I liked knowing that I was removing all of that built-up dust from my home! The iLife robot vacuum cleaner will return to the charging dock on its own whenever the battery is too low and start recharging itself. (It’s amazing how it always saves just enough juice to get itself back to the charger — I love that feature!) You can also hit the Home button on the remote and it will take itself back to the charging unit at any time. Edge/border cleaning – it follows along the baseboards in your house, sweeping up dust, furballs, and lint from the edges of all your rooms. It’s a low-profile robot vacuum cleaner (less than 3 inches high), so it slides underneath furniture with ease. As a result, it’s really great at cleaning underneath all those spots that aren’t easy to get at, and that you aren’t likely to vacuum yourself — like under the bed, behind the sofa and underneath chairs, dressers, coffee tables, and other places where dust and pet fur tend to gather over time! The iLife robot vacuum travels across different floor types with ease. On the first level of our home, we have mostly hardwood floors (and tons of throw rugs and room-size rugs). Only the master bedroom is carpeted. Upstairs, we have mostly carpeted rooms; only one large very large hallway is hardwood. If you have a lot of throw rugs like we do, you’ll appreciate the fact that the fringe on the rugs does not get tangled in this robot sweeper! I have never once had it happen. And even rugs that don’t lie flat are easy for the iLife vacuum to maneuver over — especially the V8 model. With furniture pieces that have a low clearance (like a coffee table or bench seat), the 3-inch high iLife vacuum will sometimes start to clean underneath those items and then get stuck, need to be manually removed from underneath the piece of furniture, and then be restarted. It’s not a huge deal, but can get frustrating when it keeps happening. I wish the iLife was WiFi compatible — so I could tell my Google Home (or Alexa) to turn on the vacuum and start cleaning the house. This is a luxury item though. It’s not at all difficult to use the handheld remote to do the same thing! The iLife vacuum manual could be more thorough. But then again, I used the iLife robot vacuum straight out of the box without reading anything at all! The only reason I wanted to consult the manual was to make sure I was using the remote correctly — do you push a button and then hit the “play” button on the remote? Or do you hit the play button on the remote and then push a button for the type of cleaning you want to do? It’s a guessing game. It has a built-in Lithium-ion battery (2600 mAh). The battery life is comparable with other robot vacuum cleaners. On the basic A8 model, it will clean continuously just over 2 hours — which is pretty good. The V8 will clean continuously just over 1 hour. (I think the time is much shorter because there are extra high-tech features on the V8 that use more battery juice.) However, since the iLife vacuum drives itself back to the charger and starts re-charging on its own, I personally don’t care how long the battery lasts each time — as long as my floors get clean. There’s a HEPA filter included — plus a spare one (and replacement side brushes, too). It has a programmable memory with the ability to clean 24 hours a day 7 days a week — but I prefer to run mine only when I’m home. (In case something gets tangled, or a dog’s paw gets in the way.) I usually set my iLife vacuum cleaner to run in the evenings — when all of 5 us (husband, me, and 3 dogs) are in the same room and watching TV before bed at night. That way, it doesn’t get in way of 12 playful paws during the day! You can’t keep the charging unit inside a closet — like a walk-in pantry or cleaning closet. We have a large walk-in pantry where I keep cleaning supplies, vacuum cleaners, etc. It’s a long, deep space underneath our steps to the second floor. Even though there’s a clear path from outside that pantry door to the charging unit inside the pantry, I wasn’t able to get the vacuum to “go home” and start recharging on its own there. I had to move the charging unit to a wall in a large open room instead. TIP: If you don’t want to leave the charging unit out in the open where everyone can see, just plug it into an outlet that’s located behind a sofa or a chair. It’s fun to watch the iLife vacuum slither underneath our sofa every time it “goes home” to recharge itself! You still have to manually clean the stairs — but this is true with any robot vacuum cleaner. Robot sweepers simply cannot clean stairs. I use a hand-vac to sweep our stairs. It’s quick and painless. You have to be diligent about keeping all cords and wires (and dog toys) from touching the floor during the time the iLife robot vacuum is running — because those types of things on the floor could become entangled in the brush roll bar (on the A8) or wrapped around the spinning side brushes (on either model). NOTE: The one and only time I had an issue with the iLife robot vacuum cleaner was the time it got caught on my phone charging cord that was plugged into the wall, but the phone end was lying on the carpet. The good news: the iLife vacuum did not chew up the cord at all! Instead, it stopped running and turned itself off waiting for me to remove the cord. The wet mopping feature on the V8 model of the iLife robot vacuum cleaner is similar (in theory) to the Bona spray mop that I use regularly on our hardwood floors. I will continue to use my well-loved Bona for deep cleaning the floors, but I like having this auto vacuum cleaner to “spot clean” muddy paw prints when the dogs come in from playing outside on a rainy day. With 3 dogs and 12 paws of mud, this feature is a timesaver — as long as you get the muddy paw prints right away, because the iLife V8 doesn’t “scrub” at all. It only mops, which means it really only cleans wet stuff. As a result, it takes longer for the (non-puddling) water that was sprayed on the floor to air dry — about 4 to 5 minutes. 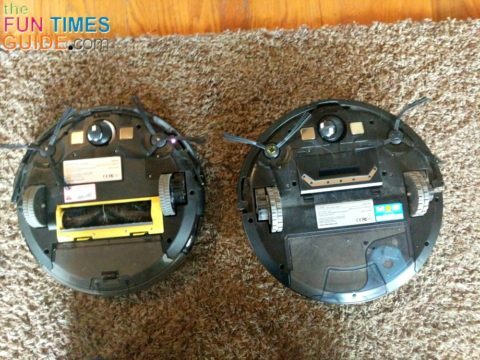 #2 – You have to make sure to first use the robot vacuum to sweep your floors before mopping them because the iLife vacuum cleaner doesn’t remain only on hard floor surfaces with the wet mop pad on the underside of the unit. Nope… it goes everywhere — just as it does when sweeping! Since the iLife vacuum can clearly “sense” when it’s on a hard surface versus carpet or a rug (because it’s not spraying water on the carpet and rugs, that I can tell), I wish it would just not go over carpets or rugs at all whenever the water bin is attached! #3 – You have to remember to remove the water bin before letting the unit make its way back Home to the charging station — because there are warnings everywhere not to charge the iLife robot vacuum cleaner with the water bin attached. To manually switch the canisters before charging anytime you’ve done wet mopping is somewhat of an inconvenience — since one of the best features about the iLife vacuum is its ability to take itself Home and recharge itself. #4 – The wet mopping feature is nice, but it requires that you be a little more hands-on with the unit and a little less on “auto pilot,” that’s all. I run them both a few times each week — mostly in the evenings. I use the V8 a little more because it’s in our main living area, has better suction, and the wet mopping feature cleans muddy paw prints when I need it. I like the iLife robot sweeper, but I’ve learned that I wouldn’t be able to rely on a robot vacuum cleaner for 100% of my vacuuming — not when it comes to deep cleaning the carpets. 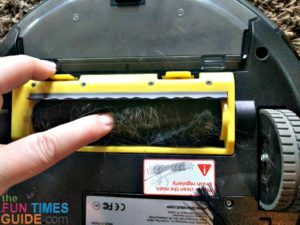 Because there is simply no feeling like having a clean house where you can “see” that the carpet has recently been vacuumed (with brush marks left behind) and know that the suction power has gotten deep down into the carpet fibers. With the iLife vacuum, I don’t get that. 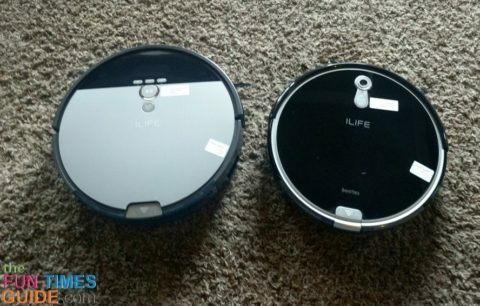 Who knows?… Perhaps the more I continue to use the iLife robot sweeper, the less “junk” will be building up inside my carpets and deep cleanings with a “regular” vacuum will become less necessary than they are now. I do like that my floors (both carpeted areas and hardwoods) are getting cleaned more consistently now that the iLife vacuum cleaner is “on duty” 3 to 4 days a week — which is more than I used to do the vacuuming myself. 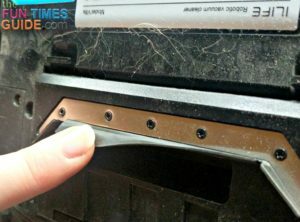 What I really like to use the iLife robot vacuum for is: edge cleaning! TIP: If you have dogs, I’d recommend doing what we did. The very first time you use a robot vacuum cleaner around them, put the dogs into their crates (or up on the bed with you or hold them on your lap) — just so they can watch you and the vacuum at the same time and “learn” how to react from you. They’ll see that you are not fearful of this machine that’s going through the house and making noises — so they have no reason to fear it either. That’s what we did with our 7-month old puppies. Older, easy-going dogs probably won’t give this self-moving vacuum much attention (ours didn’t). 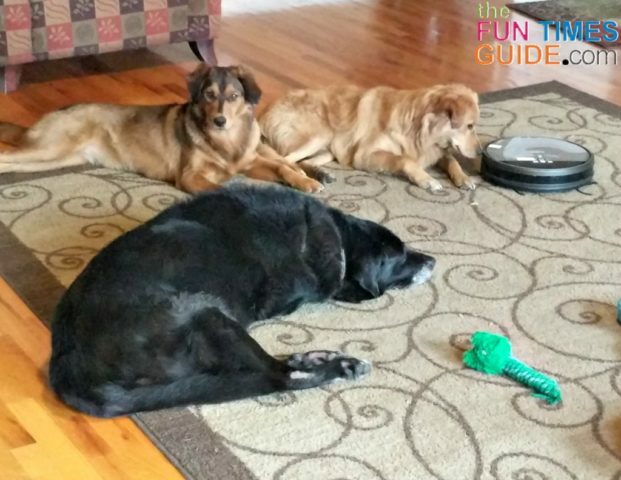 Let your dogs watch as the vacuum gets near them (or their crate), and don’t act concerned. 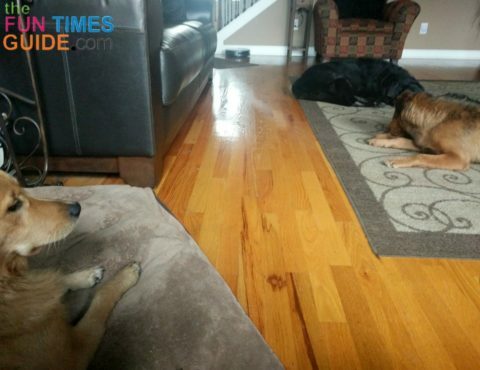 The second day, my dogs were aware that the sweeper was moving around — but they’d just sniff it and go back to what they were doing. By the third day, they didn’t even think twice about the auto vacuum cleaner — and they have completely left it alone ever since! But if you laugh or get excited when the vacuum comes near your dog, then your dog will sense that and will either want to play with it… or become afraid of it.